There is a new book in town. I am so happy for Roxanne Evans Stout whose first book has just been released by North Light Books. 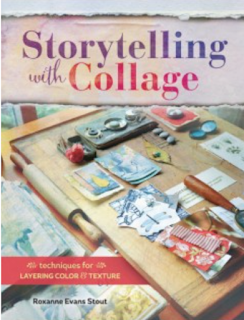 Storytelling with Collage is a special book that brings Roxanne's unique sense of creative style to life. Roxanne is well known for staging and photographing her own signature and stunning vignettes and this book is filled with these inspirational and educational images. Taking the definition of collage way beyond what is typically found in a single book, individual chapters cover collaging with textured papers, fabric, stitching, found objects, photos and images, nature, color, wax and metal. Threaded throughout the book are inspirational artist stories, step-by-step projects, sidebar notes, and tasks to complete. Gorgeous imagery is everywhere. Congratulations Roxanne, on a book to inspire. Sue! Seth has an incredible piece in this book, he is one of my Guest Artists! Thank you for this announcement Seth, I know you know how exciting this project has been to me and I am so thrilled to share Storytelling with Collage with the world! Thank you for being a part of this book as a very special Guest Artist and Friend!! I have pre-ordered a copy but will have to wait another month for it to reach me here in the UK. I am getting so impatient! This looks right up my ally, thanks! I enjoyed your article and creations in the latest digital studio!
" I am an artist"
Think I'm going to have to check this one out! Sounds like one, amazingly talented lady! Thanks for sharing. I've been waiting for this book and now I'm saving my money and hope to order it soon... it will be a wonderful present to myself in the Spring! You review sounds so tasty. it's hard to resist to see Storytelling. Thanks, Seth! I am in need of some nurturing these days and this might be just what I need! I adore Roxanne's art so i am sure to love her book!